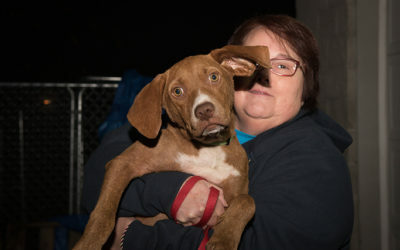 Dog Bless is a group of volunteers who send Kanawha Charleston Humane Association (KCHA) shelter dogs to rescue. Dog Bless promotes rescue efforts and assists in all aspects of transferring homeless dogs to rescues including: photographing shelter pets, networking available pets to approved rescues, operating a network of approved foster homes, coordinating veterinary services, and assisting in the transport of dogs to rescue. 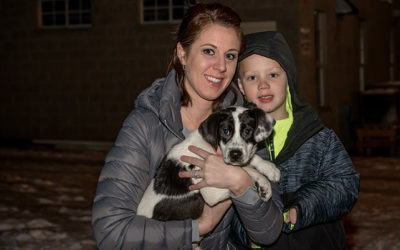 We work closely with shelter staff, rescue organizations, and fellow volunteers to find appropriate rescues for the adoptable dogs at KCHA and to provide alternatives to euthanasia. Our organization could not exist without the help of fosters and we thank you for taking the first step in getting involved. As a foster family, you are responsible for the care of your foster dog. It is our expectation that you will care for your foster dog as you would your own dog. As a foster family, you will ensure your foster dog is fed, watered, crate and housetrained, exercised, socialized and receives some basic training. We ask that our foster families commit two to four weeks to fostering each dog. If a dog has medical issues, that timeframe may be increased. Although foster families have many responsibilities, the primary responsibility is your commitment to your foster dog. When you agree to foster, your willingness to do so allows Dog Bless volunteers the opportunity to begin seeking a foster home for the next dog going to rescue. Though we try our best to place each dog in a foster home that will fits its lifestyle, that’s not always realistic due to the volume of dogs we pull. We would kindly ask that if you agree to foster a dog, that you keep your commitment and see it through. Relinquishing your foster creates additional work on our already overloaded volunteers. If you have pets of your own, Dog Bless requires that they are up to date (UTD) on their shots and spayed/neutered. Your dogs should be vaccinated for distemper, Parvo, rabies and bordetella (kennel cough). Your dog should also be on flea/tick preventative and heartworm preventative/intestinal worm preventative (Interceptor, Heartguard, etc.). If you have a puppy that has not had the complete series of 3 vaccines (4 for some breeds), you should not foster a dog from the shelter. Even though your puppy is “UTD” for his age, he is not fully protected until 2 weeks after the final vaccine. You may pick up your foster dog at KCHA (1248 Greenbrier St., Charleston, WV 25311). The shelter is open noon to 6:00 pm Monday through Saturday, and noon to 3:00 pm Sunday. Please bring a leash with you. When you arrive, introduce yourself to the front desk staff and let them know what dog you are picking up. If your foster dog is on medication, take the remainder of its medication with you. Contact Dog Bless for dosage instructions and with any questions. It may take your new foster dog a few days to adjust to its new environment. Please be patient with your foster dog, and reassure her at all times. Until you become acquainted with your foster dog, you should monitor or crate her 100% of the time. This reduces unwanted habits like chewing, accidents, and so on. Dog Bless recommends crating your foster dog at all times when you are away. All foster dogs MUST wear a martingale (no-slip collar) and ID tag at all times. Dog Bless will provide these for you. If your foster dog does not have a martingale and tag, please contact Gina Young at (304) 421-1443 immediately. A martingale is a type of dog collar that reduces the risk of collar slipping. A martingale collar is made with two loops. The larger loop is slipped onto the dog’s neck and a leash is clipped to the smaller loop. When the dog tries to pull, the tension on the leash pulls the small loop taut, which makes the large loop smaller and tighter on the neck, thus preventing escape. Properly fitted, the collar will be snug when not in use. Tighten collar until you can only place two fingers between the martingale and the dog’s neck. If you lose the tag or need a replacement, please let us know. In trying to conserve our resources, we retrieve the martingales and tags at time of transport. A requirement of our rescues is a shelter separation period, or “quarantine.” The quarantine period begins the day you pick up your foster dog, and continues until the day your foster dog transports. The purpose behind the quarantine is to separate the dog from any shelter germs. In the event your foster dog has contracted a shelter-borne disease, they would likely show symptoms within 14 days. Beyond 14 days, the dog is considered quarantined, and if healthy, is safe to travel. In most cases, our rescues wait a minimum of 14 days before transporting rescued dogs. Transport can be stressful and can cause dogs harboring diseases to become ill. Imagine the implications if one dog on a transport breaks with a contagious disease – all dogs on the transport are at risk. Because the quarantine is critical, our foster families must not bring any new dogs (fosters or otherwise) into the environment of a foster dog while fostering for Dog Bless. You must also agree to abstain from exposing your foster dog to other animals that may not be current on vaccines (i.e. dogs at the park). We require our foster families to properly restrain their foster dogs, either on-leash or in a fenced yard, at all times. If you have a fenced yard and let the dog run loose in the yard, do not leave the dog unsupervised until you are sure they can be left alone safely and won’t try to escape. Dogs are never to be left alone outdoors while you are away. Whether or not you have a fenced yard, you should make every effort to walk your foster dog daily to help her develop good leash manners. 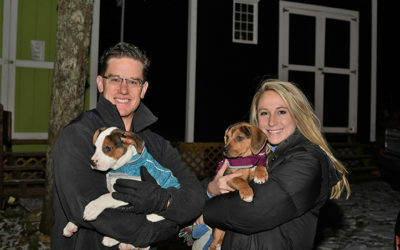 Many of our dogs go to large cities in the northeast where they are leash walked everywhere. On-leash manners are imperative. Over the foster period, you will get to know your foster dog better than anyone else. As such, it is imperative to accurately evaluate and report the temperament of your foster dog to Dog Bless and your foster dog’s receiving rescue. Details to mention include: overall description of foster dog; house/crate training progress; basic commands training progress; behavior with other dogs, cats, children; behavior on leash; energy level; specific fears, and so on. In addition to the bio, you should send photos of your foster dog to dogblesswv@hotmail.com. The best photos are clear, taken outdoors, center on the dog’s face, and include a full body shot of the dog. If the dog is exhibiting any behavioral issues such as human aggression, dog aggression, food aggression, toy aggression, separation anxiety, excessive barking, destructive chewing, excessive digging, submissive urination, shy or fearful demeanor, etc., please let us know immediately. The following are examples of how you can safely evaluate your foster dog during time with your family. Can you pet her all over her body? Handle her feet? Her ears? Does she interact well with other dogs? If so, what types of dogs has she had an opportunity to meet? (Puppies, seniors, energetic, mellow, male, female, large, small) Does she interact well with cats? Is she tolerant of being approached by strangers? Men? Women? A “foster failure” is known as someone who adopts their foster dog, in essence “failing” as a foster. Dog Bless understands falling in love with your foster dog is easy, and letting them go isn’t. Though we are sympathetic to our fosters’ desire to adopt, dogs in foster care through Dog Bless are no longer available for local adoption. They are the property of their receiving rescues. Often, rescues pull dogs with specific adopters in mind. If you wish to adopt your foster dog, you must contact its rescue and complete the adoption application process. Just because you are the dog’s foster parent does not mean you will be approved to adopt the pet. You may find the desire to “foster fail” overwhelming with your first few foster dogs. We strongly discourage families from adopting their first three fosters. Though it is difficult, you will find fostering becomes easier over time. The homeless animals at KCHA desperately need you to be a foster family. By fostering, you are saving two lives: your foster dog, and the life of the dog you made space for in the shelter. When you adopt, you limit the time and space you could dedicate to fostering.